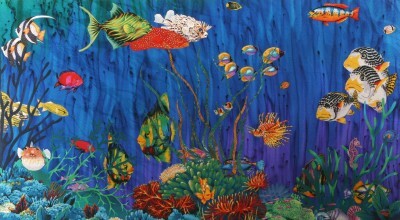 Welcome to my colorful world of Fabric Decollage! I'm Debbie Jones, from Albuquerque, New Mexico. Fabric Decollage is an original technique that's a cross between collage and decoupage, created by bonding many fabrics together in layers. 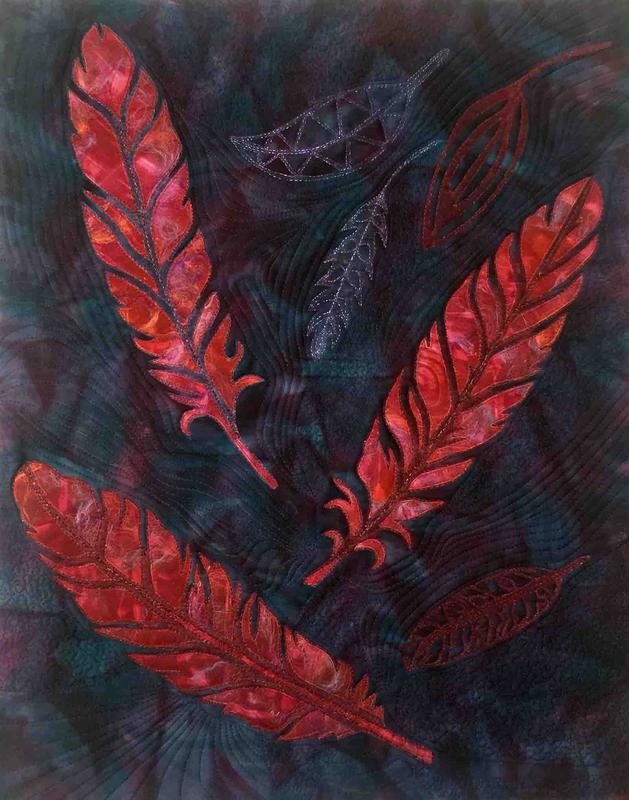 Almost every kind of fabric can be found in these decollages, including commercially available and hand-painted pieces, ranging from cottons and silks to ultrasuede and metallics. Sometimes I start with a single piece of fabric that inspires me and then build a collage around it. More often, I start with a color scheme in mind and then choose various fabrics, cutting them in a free-form manner and building the layers as I go, envisioning landscapes or underwater seascapes or even perhaps a "dreamscape". Each decollage is one-of-a-kind. Once the fabrics are glued in layers, the finished artwork is then placed in a large press that applies high pressure and heat to flatten and bond it to a sturdy, acid-free surface. 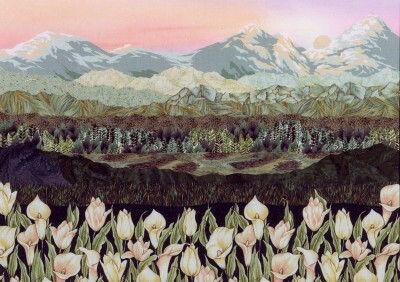 The result is two-dimensional artwork that resembles a painting -- a "fabric painting"! Most of them are matted and framed, although they can be quilted rather than being mounted and framed. This is a unique way of working with fabric that I've developed over the past fifteen years, after injuries from an auto accident left me unable to machine quilt for a long time. Please take a look around to see examples of this distinctive art form and let me know if you're interested in purchasing my work or commissioning me for a custom design. Your comments would be most welcome. Thanks for stopping by my website -- I hope you enjoy your visit! "Consider the Lilies" Fabric Landscape 25"x31"
"Enchanted Ocean" Fabric Seascape 19"x30"
Come and take classes with me this summer in beautiful Texas Hill Country! I'm so excited to have been chosen as Artist-in-Residence this June for five days that include a lecture and five classes -- FUN! Take any or all. Click here for the guild flyer with class & registration info. Click here for my Schedule Page with class info. Finally, my crazy life is settling a bit and I've scheduled a Silk Fusion Vessel Class at my home in Albuquerque. It will be held on May 11, the day before Mother's Day. Click here to see all the details on my Schedule Page. Other dates for this class are June 28 and August 10. Small classes, big fun!! Other classes scheduled at my house this summer are a Fabric Landscape Decollage Class on July 27 and Silk Fusion Wallhangings, a 2-part class on August 9 & 16. I'm still looking for a suitable place for an Ice Dyeing Class in Albuquerque or Santa Fe. Let me know if you know of a place where we can make a mess (and clean up afterwards), inside or shady outside, with access to sunshine and running water. We'll need tables too. Thanks! May 30-June 1: Booth at Fiber Arts Fiesta in Albuquerque, NM. Click here for a link to their website with all details. July 19-21: Booth at Form & Fiber Show by EVFAC in the DeVargas Mall in Santa Fe, NM. If you would like to receive my monthly email newsletter, please email me your name, email address, and city/state. (I'll never share or sell this info to anyone, ever, promise! Lots more fun things are in the planning stages! Please check back soon for the latest updates. copyrighted by Debbie Jones, 2005-2019. 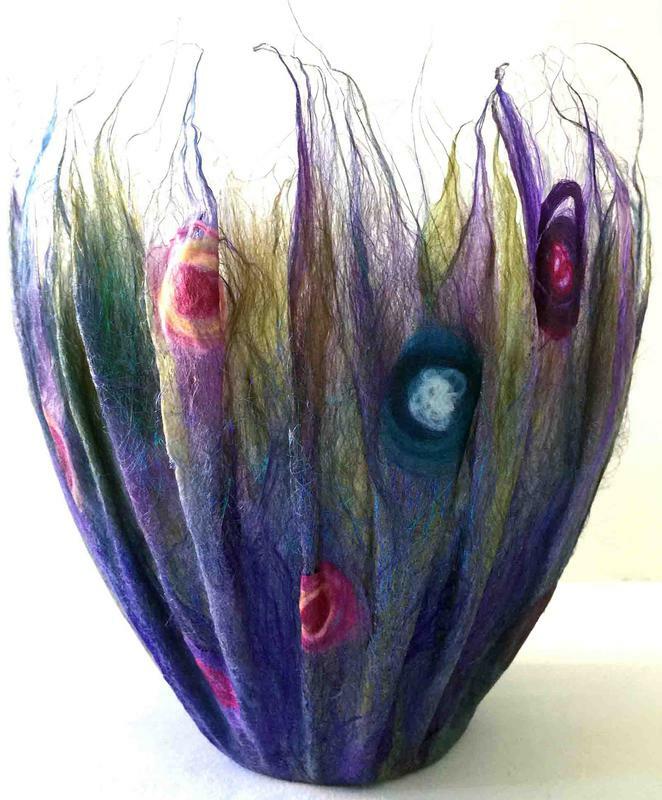 Click here to see more Silk Fusion Vessels. featuring Silk Fusion for the feathers. along with quilts and decollages using this fun "fabric"!